It was a normal sunny summer’s day as I made my way up to the local farm shop with my little dog, Rufus, trotting along besides me. We both enjoy walking up the track to the farm house, for me seeing the sheep with their lambs in one of the paddocks on either side, and for Rufus to sniff the many enticing aromas and the occasional chance of eating sheep’s poo! Having bought what I wanted we began to head back down the track. However, today there was something different. One of the ewes, still in her very thick and long woolly coat, made her way over to near the fence. Although the sheep generally aren’t fazed by people walking by, they don’t usually come over to say ‘Hi’ as this one was doing. I waited and chatted to her as she came closer and closer. I couldn’t see her eyes at first because her coat was obscuring them, but when she turned her head I noticed rather startling eyes. She stared boldly and took further tentative steps forward. At this point the farmer’s wife appeared as she’d noticed me making friends with her ewe. She told me how friendly she had become with this particular sheep who’d most likely been bottle fed as a new born. By this point the ewe was right by the fence being stroked and even bending down to greet Rufus! He hasn’t been so close up and personal with a sheep before – so a new experience all round! She explained that she was giving her plenty of treats to spoil this ewe because she was due to be sent to market probably on Monday morning. My heart sank as I realised that ‘going to market’ meant being sent for slaughter. The reason the farmer was doing this was because she didn’t take care of her lambs properly. The lady was clearly upset by the thought of losing her tame ewe but had to face the reality of farming as a livelihood. In fact, the reason the ewe still had her thick coat in the hot weather was to make her look fatter than she was and therefore reach a better price. I walked away with a troubled mind and heavy heart. Here was an animal who had learnt to trust humans but now faced the stress of being transported to the market and then to the slaughterhouse. Of course, I understand the practical necessity of farming, but I felt distressed by the thought of this creature’s trust in human kind being betrayed. At home I couldn’t settle and was soon on the phone contacting a number of local animal charities to explain the situation to try to find an alternative option for the ewe, but my calls yielded nothing positive, so I tried to let it go – unsuccessfully, of course. The next day was Sunday – the day before the ewe might be sent to market. It was around 3pm when I got a sudden inspiration. 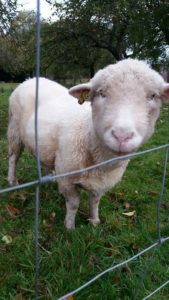 I would offer to sponsor the ewe – to pay the market price for her and then to pay for her upkeep at the farm for the rest of her life. I was really pleased when my husband supported the idea – the next task was to make the offer to the farmer and his wife. I wrote a note and whizzed back up the road only to find the farm closed. In desperation I tried to make my note visible in their outside letterbox but it fell inside. Oh dear, the farmer was hardly going to check his post before going to market first thing in the morning. The only thing I could think of was to hang a tissue on the outside of the letterbox and hope they didn’t think it was just kids messing around! However, to make sure they got the note, later that evening my husband and I drove up there to stick a note on the gate to say, “Note in letterbox re: ewe!” After which we had to wait – would they accept my offer to sponsor Grace – as I had decided to call her? Or would they think I was just a crazy animal loving person? Monday morning dawned and I went to work as usual, still with Grace very much on my mind. Around 10am my husband contacted me to say that he’d heard from the farmer’s wife. I listened with my heart beating faster than usual as my husband explained that the farmer had agreed to keep the ewe – to give her another chance. Relief all round – Grace was saved! And she’d already been shorn so was no doubt feeling much more comfortable in the summer heat. Although it turned out that I needn’t have worried, as Grace would live to see another Spring, I’m glad to have made the offer, which will be kept open in case Grace needs sponsoring in the future.